On August 21, 1955 the Taylor family was visiting their friends at a farmhouse in Kentucky when they had a close encounter of the weird kind. It all started when Billy Taylor went to go get some water from the well. When all a sudden he saw a rainbow colored disc shaped UFO land less than a mile away. Billy ran back and told his family. But they all laughed at Billy and they told him that his eyes must have been playing tricks on him. But not to long after Billy’s sighting the family’s dog started to go crazy and barking at the door. So the men of the family grabbed their rifles and went outside to go see what was scaring their dog. And just right after they opened the door they came face to face with a glowing entity that was about 3 feet tall, had a huge head, floppy ears and glowing eyes. And if that wasn’t scary enough they also said that this creature was floating. They also noticed that it was wearing a silvery metallic outfit. The men were frozen in fear, they just couldn’t believe their eyes. Then this creature started to charge at the men, the men went into panic mode and started to shoot at this creature. Now the gunfire scared this being and it ran, or floated back into the woods. Then the men ran back into the house and tried to make sense of what just happened. A couple of minutes later this alien or whatever it was, was looking through the window. 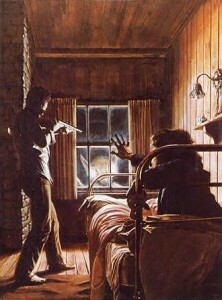 The whole family started screaming and the men started firing their rifles, they were shooting like maniacs. After the smoke cleared they were sure that whatever this was, was dead. So they went outside to see if they could find the body, but there was no trace of this creature anywhere. On the way back to the house they saw another one of these creatures on the porch. The men again started to fire their rifles, they now believed that these being where bullet proof as they watched the bullets just bounce right off their skin. But nevertheless the gun fire scared it and it floated back into the darkness. The men ran back inside the farmhouse and started to fortify their house. They hoped that this was all over, but this was just the beginning. Later that night the creatures started to appear again at the windows and the Taylors believed that their had to be more than two of them. And for 3 hours the men were running all around the house shooting like crazy doing whatever they could to scare these creatures away and protect their family. Once things died down the Taylor’s made a run for it, they ran as fast as they could to their vehicle and floored it out of there and went straight to the police station. Sheriff Russell was the first to hear about the Taylors out of this world encounter and the first thing he did was a sobriety check. Once the Sheriff realized that they were sober he tried to comprehend and makes sense of what happened to these people. After a couple of hours passed by he realized that this was not a prank, he knew that these people experienced something terrifying as he could see the fear in their eyes. Now when the police went to go investigate they couldn’t find no signs of these creatures but they did notice that the house was filled with bullet holes. Now during that night there were tons of strange objects being reported in the sky. Even a state highway trooper saw one of these oddly colored flying objects. Making A lot of people believe that the Taylors might just be telling the truth. 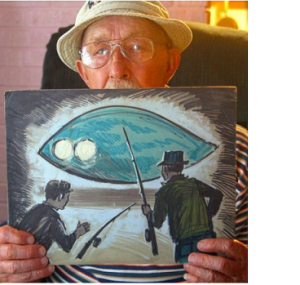 Brazil September 15, 1977, a bus driver named Antonio spotted a huge hat shaped UFO in a field near his house. Antonio estimated that this craft had to have been at least 250 feet long and a couple hundred feet high. Antonio very curious started to approach this craft but as he was getting closer he started to get afraid as he started to realize that this couldn’t be man made. So Antonio turned around and started to run. Then Antonio noticed a very bright blue light coming from behind him and this light paralyzed him. As Antonio was frozen stiff he started to hear some noises behind him, then he came face to face with some strange looking robot’s. These robot’s were about 4 feet tall and had very small antennas on top of their heads. These robot’s also had very odd elephant like arms. The frozen Antonio watched in fear as they started to inspect him. After the quick inspection the robot’s took Antonio to the huge hat shaped craft. Antonio found himself in a very large, very oddly colored circular room. Antonio noticed that he was surrounded by robot’s. The first thing these robot’s did was take some of his blood then they escorted him through this massive craft. Antonio couldn’t believe what he was looking at, he knew this craft was big but he couldn’t grasp how big it actually was. Antonio saw a huge city within this UFO and there were robot’s everywhere, they were building all sorts of stuff. Now once the robot’s were done doing whatever they were doing to him they dropped him off in the middle of the city. Antonio was completely naked and he ran straight to the police station. Now because of the fact that there were ton’s of sightings of this huge hat shaped UFO as well as some of the eye witnesses even swear that they saw Antonio coming out of it made this 1977 UFO abduction case extremely famous in Brazil. On October 11, 1973, a man named Charles Hickson and Calvin Parker were fishing off one of their local piers. While they were fishing they started to notice a very odd bluish object in the sky. This Object was very strange and they started to wonder what it could possible be. Then when it started to get closer the men knew that this craft just couldn’t be man made. At this point the object was not to far away from the men and it stopped just right above the water. Then 3 very strange beings came out of the craft. The beings were just hovering over the water and they started to approach the fishermen. The fishermen were scared out of their minds. These beings were grayish in color, about five feet tall and had very odd shaped heads. They also had very odd things coming out of their faces. It was very hard for these fishermen to comprehend what they were seeing and they thought that these creatures might not be creatures at all but robot’s. When these things got close enough they actually tried to communicate with the men. And Calvin passed out right on the spot and Charles just stood there frozen in fear. Then these beings or robot’s took these men to their craft. Once inside the UFO Charles and Calvin were taking to different rooms and Charles will never forget what happened to him. He was being scanned and operated on by a huge eye. In his own words. “There aint no way to describe it. It looked like an eye. Like a big eye. It had some kind of an attachment to it. It moved right in front of my face. I saw dials and gadgets moving all around. It went behind me, then came back over me. It went all over my body, up and down, then it disappeared back into the wall. I was scared to death. I thought I was going to die. Now after these men were examined they were returned to the pier. Charles and Calvin couldn’t believe that they were still alive and not to long after this encounter they told the world what happened to them, and of course most people laughed at their story. On February 23, 1975, two boys in Japan noticed a pair of orange UFO’s in the sky’s. The boys were amazed and couldn’t stop looking at this UFO. Then the two objects started to release a bunch of smaller UFO’s. And these smaller UFO’s started to descend to the ground. One of these UFO’s landed really close to were the boys were playing, so the boys ran to go see if they could find it, and it didn’t take them very long. The boy’s spotted one of these smaller UFO’s in a vineyard within their estate. The boy’s were staring in awe wondering what this object could possible be. Then a hatch opened up and some very odd creatures started to come out. These creatures were 4 foot tall, had silver uniforms, large pointy ears, brownish wrinkly skin and 3 very large metallic looking fangs. Right away these alien’s saw the curious boy’s staring right at them in total amazement. One of these creatures walked right up to them and patted them on the shoulder and it tried to communicate with the boy’s. The boys scared to death ran home as fast as they could and they told there family’s what they saw. One of the mother’s believed that something must have happened to her son, and a lot of people in the neighborhood were wondering what was going on as these boy’s were very loud and very hysterical. The boy’s told everybody to follow them and when they got to the location they all saw this orange object take off at amazing speeds, the light coming from this craft was so bright that the onlookers had to close their eyes. Now the boy’s were the only ones to see these alien beings but since so many saw the UFO an official investigation was launched. The investigators did find a ring pattern on the ground where the UFO landed. And they also found traces of radiation making these a very interesting UFO sighting and alien encounter. John scared out of his mind ran back into his car and he floored it out of there. 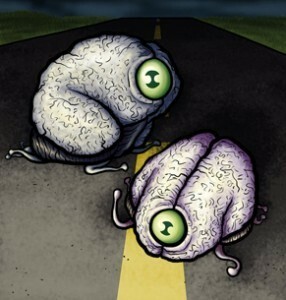 Later that night when John returned home he encountered these 2 huge brains again and he passed out. When John came to he realized that he was in some sort of control room. Then he came face to face with beings a lot more terrifying than the huge brains he had just encountered. He was greeted by a group of 7 foot tall, grey skin humanoids. These humanoids had six webbed fingers and toes. After a short introduction these alien grey’s started to show John holographic images of a nuclear war. John believed that these aliens were showing him an actual event that happened on another planet. And these alien beings warned him that if our species doesn’t change this will most likely happen to us. Then John started to feel very dizzy and again he passed out. And woke up a little bit later back in his car. And from that day forward he let the world know about the message he received. Now one thing I would like to add is I come across a lot of these kind of stories were these highly intelligent beings abduct people and warn them about our future. Why don’t they just abduct the worlds most powerful people and warn them, that way we might just have a chance at saving our world, and ourselves.